Don’t ask me how exactly this happened, but in a cabin on a mountain over the weekend we got ourselves into the classic Liar-Truth Teller Enigma, later embellished by the brilliant logician Raymond Smullyan. It’s an old logic puzzle, which runs, basically, something like this. A man finds himself standing in front of two doors: one which leads to heaven and the other which leads to hell. 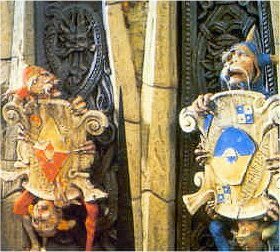 In front of the doors are two guards, one which always lies and the other which always tells the truth. The man does not know which door is which, nor which guard is which. He must ask one question of one of the guards to determine which door will lead him to heaven. You may recognise the puzzle from its use in The Labyrinth (1986) starring David Bowie and Jennifer Connelly (a film we later rented). After a couple of hours of testing it out using live liars and truth-tellers in front of two bookshelves (both of which led precisely nowhere), the keen examinees gave their answer: “Guard, what would the other guard say if I asked him where his door leads?” Whatever the reply is, the opposite is true. Why? Well, let’s say the door behind Guard A leads to heaven. If Guard A is a liar, then he will lie and say that Guard B would say his door leads to heaven. If, however, Guard A is the truth-teller then he will report that Guard B would say his door leads to heaven; and in this case Guard A is faithfully reporting the fact that Guard B will lie. Either way we have the same answer, and the opposite is true. In both cases the liar is involved in the answer and the answer is always false. Three gods A, B, and C are called, in some order, True, False, and Random. True always speaks truly, False always speaks falsely, but whether Random speaks truly or falsely is a completely random matter. Your task is to determine the identities of A, B, and C by asking three yes-no questions; each question must be put to exactly one god. The gods understand English, but will answer all questions in their own language, in which the words for yes and no are ‘da’ and ‘ja’, in some order. You do not know which word means which. It could be that some god gets asked more than one question (and hence that some god is not asked any question at all). What the second question is, and to which god it is put, may depend on the answer to the first question. (And of course similarly for the third question.) Whether Random speaks truly or not should be thought of as depending on the flip of a coin hidden in his brain: if the coin comes down heads, he speaks truly; if tails, falsely. Random will answer ‘da’ or ‘ja’ when asked any yes-no question. Hmm, I’m not sure I understand the question, Lyka. The question is: “Would the other guard say his door leads to heaven?” Whatever the answer is, the opposite is true. If the riddles of Raymond Smullyan likes you, then this web ( http://4chests.blogspot.com) too. Sure. I love a good riddle me. Just thinking that riddle sounds like a meeting at stormont except all parties involved are type 3 random truth and lies. I thought that one of the conditions of this riddle is that the guards can only say yes or no. point to a door and ask one of the guards “Can you tell me that this door leads to heaven?” If it does, the truth-teller will say “yes,” and the liar will also say “yes” because he actually can’t – that would be telling the truth. If it does not, the truth teller will say “no” because he can’t lie, and the liar will also say “no” because he can (he would, in fact, be obligated to). That’s an interesting answer I hadn’t heard before. Hmmm I can’t think of a reason it wouldn’t work…. There is no stipulation that the guards know that the other guard always lies or tells the truth so this answer is wrong.The first version of this that I heard you could ask one question of each of the guards.In that case the the questions I ask are.Guard 1…Are you a guard?If he says yes I know he is not the liar.I then ask the other guard does your door lead to heaven?Asking a question you know the answer to reviels the liar. Guys, in each of the last few answers, you aren’t finding out which door leads to heaven and which leads to hell. A random math question, asking if they are a guard, and asking if both doors lead to heaven (the true answer is no)… those questions will only tell you which is the liar and which is the truth teller, but they won’t tell you which door leads to which place. Since you only get one question, both of these are insufficient.